update and refresh a tired space! The renovation begins today. I can’t believe I’m actually saying that, but it sure sounds good. It’s been over six weeks since our toilet overflowed and this whole process was put into motion. I definitely would not have planned it this way, but life rarely goes according to plan. I have been dreaming about hardwood floors for years and have been saving my money for a while. I had enough saved, I thought, to perhaps begin to think about shopping for floors. I was still thinking maybe in 2018…definitely not before this fall. As sometimes happens, the decision was made for me and my time table went flying out the window. To prepare for the work to begin, we moved all of our furniture, except the antique dresser, into the garage. We wanted to make it as easy as possible for the flooring crew and for the carpenters coming when the floors are finished. We are having all new baseboards installed plus a few extra updates. I’ve been obsessed with board and batten paneling since the first time I saw it. It’s seen a surge in popularity with the Farmhouse Style trend, but it’s actually been around for centuries and originated in Europe. In fact, it’s in Violet’s sitting room in the Dower House on Downton Abbey. Anyway, when I found out we had to replace the baseboards, I decided it was now or never. Next to the hardwoods, I’m most excited about the board and batten. I’m not sure about the rug. It looks sort of taupe but in some pictures it looked beige and ivory. To make sure, I have ordered a 2 x 3 so I can see the color and texture in person. If I like it, I’ll order a big one. I’m also not sure if I want a rug in the dining room or not. I may have to actually see the furniture put back in place before I can decide on that. So that’s where we are right now. I’ll keep you updated but I’ll be careful not to get annoying about it. I’ll still be sharing new ideas as often as I can. Thank you so much for stopping by…see you soon. Love your style. Several months ago you shared information on your blanket ladder. Unfortunately, I didn’t save it and would now like to purchase one. Could you share with me again? Thanks. This is not the exact blanket ladder that I have…but it’s a good price and very similar. It’s actually nicer than mine! Your new logo is just beautiful . Fits you and your site perfectly. It would be nice to print and hang in your foyer . Hi Ann – I had to remove all the rugs from my hardwood floors because of the natural light coming through the windows over time turned the color of my floor. I noticed when I removed the rugs to clean the floor there was a darker spot the size and shape of the rugs. I removed the rugs so my floors would stay the same color. Ann, where did u get your blanket ladder? I’be been wanting one for the longest time. Thanks! I got my blanket ladder from a seller on eBay several years ago. There is a huge selection on eBay and Etsy. Just search “vintage blanket ladder” or “vintage ladder.” Good luck! Where did the black porch planters come from? Ann. your dinning room looks much different than the before pictures! Beautiful reveal! You worked very hard to accomplish this makeover and now you can enjoy for a long time to come. Best Wishes! 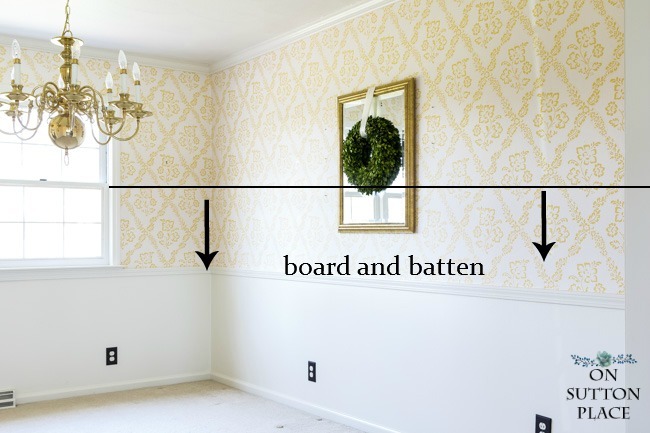 What’s the paint you used in the dining room above board-and-batten? Exciting times. Best of luck. We are remodeling as well so I feel your pain and excitement. I love your home ! I can’t wait to see it completed. It looks so pretty…I can’t wait to see it! MY NAME IS JANICE AND I HAVE NEVER USED A BLOG. I AM A PARAPLEGIC CAUSED BY A BRAIN-STEM STROKE IN 2003. I AM 74 YRS OLD AND A LOT OF THINGS NOW I NEVER HAD GROWING UP, LIKE BLOGS. WE HAD OUR FIRST TV WHEN I WAS 10 YRS OLD, MY FIRST CELL PHONE WHEN I WAS IN MY THIRTY’S, FIRST COMPUTER WHEN I WAS IN MY LATE THIRTY’S. TECHNOLOGY IS WONDERFUL AND GROWING FAST! AN AFFORDABLE WOODEN CHANDELIER , AT LEAST THREE LIGHTS, AND UNDER $200. Hi Ann, what color hardwood floor did you purchase? The hardwood is from Somerset and it’s 2 1/4 inch white oak in Gunstock. A very nice dark brown but not too dark so you can’t see the grain. I love all of your choices, Ann. Your room will look amazing with the board and batten walls. Not sure about the stripe, but love the floral. Floral and paisley have always been my thing. I can’t wait to see the results of all your hard work. I love your style of decorating ! I love the greenery wreath that you’ve used in various spots in your home. I ordered one recently but need to know how you hang it. I see that you have a silk ribbon attached but how did you hang it on the dining room mirror in the photo shown here? I love your style and am excited each time my inbox has your most recent post. I live in California but love the farmhouse style. It must be my Michigan roots. Thanks for all of your inspiration. To hang the wreath on the mirror I just took the ribbon, looped it through the wreath and then stapled the ends to the back of the mirror frame. I used a staple gun. If you have a metal frame, you would probably have to use some sort of strong tape. I hope this helps! Thanks, Ann, yes that does help. How exciting, in a strange twist of fate kind of way! Love your plans for this room. We are renovating our home and the best part is the hardwood floors. 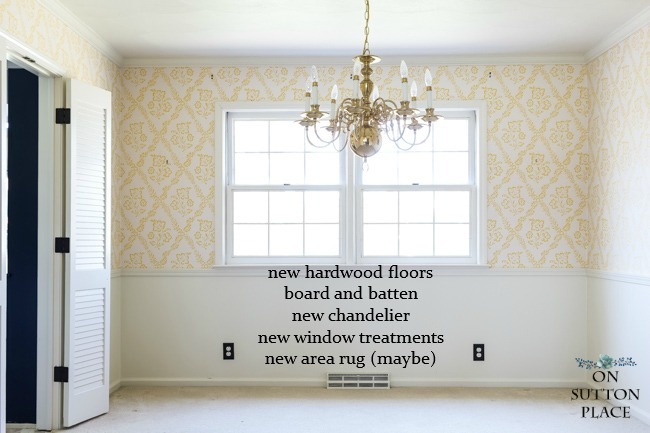 Well, the removal of dark and dated wallpaper is pretty high on the list, too. But, I’m most excited about our hardwood floors. Can’t wait to see your space!! Perfect timing! Your makeover will help me make decorating decisions with our new sun room that is in the process of being built. So far it looks like we both chose the same flooring. Looking forward to seeing your progress. I know your new improvements will be lovely. I can’t wait to see them! Ann, this is so exciting, and I love the direction you are going in your choices! One of my SIL’s has white board and batten in her dining room and navy paint above. It is sooooo striking and beautiful. I’d be glad to take a pic if you’d like. And I love your new logo! I noticed it immediately! I’ve never been so pleased to hear that a toilet overflowed! 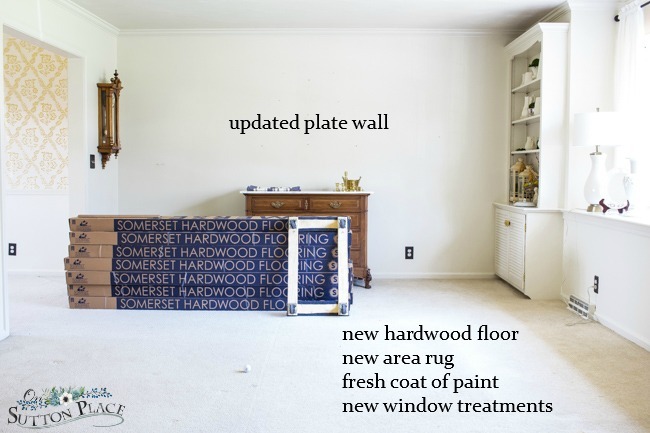 Your space will be fantastic Ann and I am so excited to be able to view the makeover. Please — annoy us !! I can’t be the only one who LOVES makeovers! It’s so much fun to watch the step-by-sep process! It’s very impressive that you had been saving for and planning on putting in wood flooring; apparently ‘life’ just nudged (or shoved!) you into taking action sooner than you planned! That is so exciting!!! Love your choices of replacement or new adds.. Looking forward to seeing the finished design. This is exciting for you! I love all of your choices. I think a navy in the dining room above the wood treatment wood be striking. You could even do a faux grass cloth paint treatment . Diane of inmyownstyle.com did a nice tutorial on it. Just my two cents. I will love whatever you decide. Keep us posted. In progress is fun to see as well as the reveal. I love the way things are looking for your updates and can’t wait to follow along and I’m loving your new logo. I love the way you make something positive out of a major mishap. Only you could do that. I look forward to following you through this renovation. Thanks Kristi…the day the mishap happened I wanted to literally walk out the door! Love board and batten; you see a lot of it in San Francisco Victorian and Edwardian houses. Good luck! I am so excited for you! I know how much you wanted those hardwood floors, and waiting is sooo hard to do. I know because I waited 2 years to finish the hardwoods on our first floor and we are just getting to them now. Just think how much fun it will be to decorate and change out for the seasons with a whole new base look. Even things you have loved and used for years will now look completely different. It’s a long process, but we can enjoy the journey, all the while dreaming of the day it is finished – I always find myself just standing and looking every time I walk by a newly finished room….hope all goes smoothly for you, and thanks for sharing with all of us. I’ll be waiting for the updates. I love the choices on your mood board. I can’t wait to see the finished room. I need to do an update in my dining room too. Remove wallpaper, change light fixture, new window treatments and furniture.. We are thinking of adding a built in to replace my current hutch. I already have new furniture picked out, I just need to get the room ready. Thanks for the inspiration! I love everything I see in your sneak peak- can’t wait to see it all put together! And your new title- logo-thingy at the top of your blog is so pretty! make a made dash for the mop and towels which fortunately took care of the problem. Personally I don’t think for a minute that you are annoying in fact I love your emails and can’t wait for the big debut. BTW, I am loving your new OSP logo. Now you just sit back and enjoy the journey. I am interested in seeing how it turns out. Keep us posted! Wow, what a big undertaking! But exciting, too, to anticipate the new look. 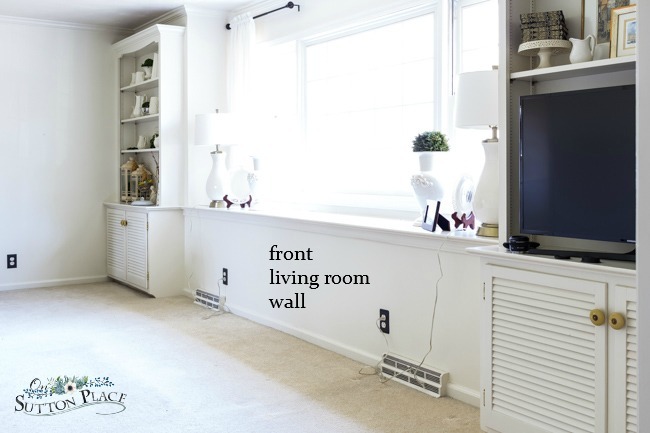 It looks like you have wainscoting in your dining room at present. Is board and batten that much different? I’m not sure I actually know what board and batten looks like. And the new chandelier—I love it! It will give a totally new look to the room. I know you are undecided about the rug in the dining room. It doesn’t really appeal to me because I am very tired of seeing the “lattice” style everywhere on all manner of things. I just think it will be dated before long. Have you had those tho’ts at all or is the lattice pattern a favorite? If it is, then you won’t get tired of it if it does go out of style. Of course, you should do whatever pleases YOUR eye first. I send my wishes for smooth sailing for you throughout the rest of the project! I’ll be interested to see the progress as the project evolves! I do love the lattice pattern but I was mainly shopping for a neutral rug that wasn’t just plain. It’s not as easy as it sounds! Most patterns have color which is what I don’t want…unless I completely change my mind which is always possible. Thanks for your comment! You sure have found the silver lining in that cloud that flooded the floors in your house. How exciting to be making the changes you’ve been dreaming of! Can’t wait to see your updates. I love your style. So excited for you, thanks for taking us on your new rooms redo. Ann I’m so happy and excited for you .Can’t wait to see what the entire room will look like when it’s finished. The mess is starting to get on my nerves! The thing is that I used the living room as my “office” so I feel completely out of my routine. I know it will be worth it in the end. Eye on the prize. I’m so excited for you. Can’t wait to follow along with the progress, and definitely to see the finished rooms! I like your lighter rug, maybe with one lighter pillow. I like a rug in the DR because of the scraping of the chairs as they go in & out. We had our bathroom do a slow leak to the room below & did not see it until the ceiling was moldy. It was only a complete redo of the bathroom and one wall & ceiling below. It happened in Nov., fired 2 general contractors the insurance co. recommended. Got it done in one month after I became my own GC in January. What an ordeal. It was worse than building a house years ago! You have my sympathies. Wow. All that damage. Terrible . It is going to be beautiful when finished. Please keep us updated. Love the colors! Can’t wait to see what you do! It will be lovely, I’m sure. I was just wondering how did you make the mood board? I would like to create one, but wouldn’t know where to,start. Hi Ann…I used a free online site called PicMonkey. 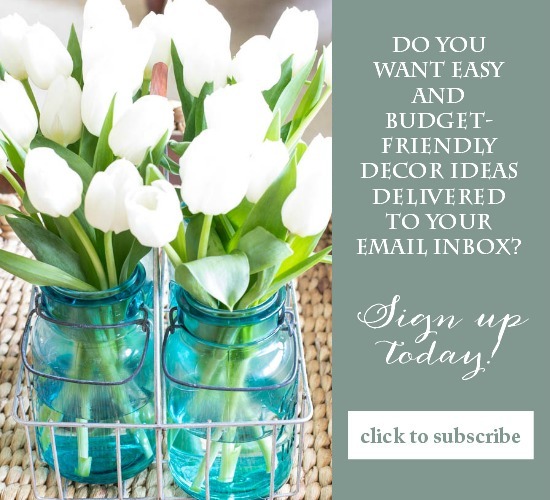 There are lots of easy tutorials on how to make mood boards on YouTube or just google it. Have fun! Well Ann, you have quite a project going; looks like you have all your thoughts & ideas in line, ready for the progress to begin. I wish I could do a remodel but don’t want the ‘overflow problem’ like you had. Besides, I don’t have the bucks to even think of it. I enjoyed first looking at your ‘before’ living room; it’s really nice. I’m sure your wood flooring will make a totally different look and feel to the room. Glad to hear that you will be keeping some of your ‘old favorites’ (we just need some ‘old familiar’ items-they are a part of us). I will be anxiously awaiting your future posts; very exciting (easy for me to say, when you are in the middle of probably a nightmare at some moments). Hopefully the worst nightmare was the overflow and now the rest will go smoothly. How fun! I am looking forward to seeing it! Ann I’m giddy excited for you …can’t wait to see the finished product!! I love the mood board. Have you thought about keeping the dining room chandelier but removing some of the ornate details. I had a rather large brass colored chandelier in my dining room. I wanted to replace it with something similar to what you have chosen. The chandeliers I liked were not in my budget. I asked my husband to take the brass fixture down. It was basically pieces all threaded together on brass rods. I took most everything off and left the curved arms for the lights. Then I spray painted it black. I did several coats of paint. It looked totally different and like the ones on my wish list. I did buy shades for the individual lights and depending on the season or my mood use them. Hi Frances…I did think about painting my brass chandelier but was able to find room in the budget for a new one. I really wanted a much simpler style…I had no idea I could take my old one apart! I’m am so excited for you! Can’t wait to see your reveal. But am so sorry you have had to deal with the mess of a water loss. Really like the mood board you shared. I’m a sucker for the blues. Just the flooring is going to such a big difference! The board and batten will be the crowning touch. Ann, this will be lovely! I’m sorry to see the wallpaper go because I love it, but you’re probably ready to let it go. Just a thought…your style seems pretty traditional. Have you considered a traditional Oriental rug? Karastan makes beautiful machine-loomed rugs that look like the real deal, but are much more affordable. I thought about an Oriental rug but would like something a bit more casual I think…and I want very neutral. I do love your chandelier too. It’s a hard choice because there are so many to choose from! I’m green with envy and can’t wait to see it finished. Very exciting for you; and yes sometimes those catastrophes can end up bringing great happiness. You could never be annoying! It’s exciting to see your vision in progress! Thank you for sharing! yay for the toilet! I think someone watching over you knew how badly you wanted those hardwood floors! I’m excited for your new look. I have questions about your mood board, how do you make one? AND is the floral fabric your window treatment? Not sure I am understanding that group of patterned fabrics? or maybe its wallpaper. If you explained this in your narrative, I totally missed it so I will read it again. Feel free to over post on my behalf! haha! Looks like it will be stunning! I made the mood board in PicMonkey. Sometimes it’s tricky to copy/save the images but it’s actually pretty easy. The stripes & floral are possible fabric for pillows. Window treatments will be neutral but I am not sure of the style or fabric yet. I’m finished with wallpaper for the time being! I love the mood board you shared. That chandelier is to die for! I also am dreaming of the day I can replace the carpet and laminate flooring in my home. I look forward to seeing what you put together! patterns, so I think they work well together.They are also only about 5 ft.
apart from each other in the living room and dining room area. I put different, but complimentary rugs in my living room & dining room. Love them! I love that you share your adventures with us. I’m excited about your redo and don’t even have to spend a dime personally. Cant wait to see how it looks when finished. I want hardwoods in my bedrooms but still in discussion with the “king of the house” about that. Have fun after all that is what life is all about. Oh go ahead be annoying:). Board and batten will be perfect for your rooms. I was wrong about a faux fireplace, but oh no, I’ll miss your dining room wallpaper. I understand though you probably want something new and fresh, are you going to have new wallpaper or leave it painted? Anyways you go ahead post, post, post! I’m finished with wallpaper for now and will paint above the board and batten. Not sure of the color yet though! Absolutely love the fabrics that you have chosen! They are beautiful. One word about the dining room rug. Sometimes when you only have hardwood floors, the sound can be very cavernous. To remedy this, I always choose an indoor/outdoor carpet for under the table. Spills clean up easily and it provides some homeyness and sound absorption. There are some really beautiful ones out there these days. Best of luck with the renovation. I can’t wait to see the end result! This is great advice so thank you Anne! I love my new logo too. If you want the designer’s name just let me know. Had no idea that golf ball was there until I was editing the pics. I laughed too. So typical! Glad you are making the best of the situation! We are currently updating a house we just bought. We also chose Somerset flooring. I, too, never thought I would be “redoing” my home but moving made it necessary. Love the mood board idea. Thanks! So excited to see the progress! I waited for a rug under the table until I lived without it for awhile, and I like it as is, but it’s personal preference. I guess I like the ease of cleaning without a rug. Best to you as you “patiently” wait for it to be finished. Love the colors and can’t wait to see the finished project.This gives me the desire to get going on a few more areas in the house that needs updating. Hope my hubby takes a trip or something. lol He hates to be around when things are getting worked on. Can’t stand the noise and disruption. haha He does however like when the work is finished and to see me happy. That’s my guy. Good luck Ann on this new “adventure”. You’re going to love it! So sorry for the disruption in your home. However, there is a positive and you have already taken the steps to get things back to their best. I wrote some time ago about how our homes are quite similar and how I admired your decorating style. A white sofa in my home would be a disaster because of resident Black Lab Lucy. I have since been searching locally for a substitute. I have been stalling on this project for some time and now, recognize that I need to get on the wagon. Hopefully, by Fall I will have my plans in place. I plan to spend lots of time in our motor home this Summer and Fall and have some projects to do in there too. Much smaller scale but I will follow your posts closely for inspiration and practical information. Thank you so much for sharing this process. Thank you Cheryll! I do keep our sofa covered with a quilt most of the time. It’s easy to pull off if I have guests and it’s super easy to throw in the washer. A black lab would be a challenge for sure but as a member of the family it’s worth the extra time and trouble! That is so exciting Ann. So happy for you and can’t wait to see how it all comes together. Ha totally know what you mean!! Well, since your house and mine are sooo similar in style I am very excited too about the project. I love the new chandelier already! How exciting Ann! Can’t wait to see more. Never worry about posting too much on this type of thing :) We are all decorating junkies. I’m sure it will be a dramatic and beautiful change. So excited for you! It’s gonna be fun and so pretty! This will look so great! Oh, I can’t wait for the reveal. Sorry a flood prompted this, but what fun to get this done quicker. Beautiful! Your colors and rug choice are very much like what I chose when we were forced into a redo due to toilet overflow! Sometimes the worst luck turns into a happy ending! Good luck, I’m sure it will be lovely! How exciting, I look forward to future post although I am sorry for what you had to go through to get to this process. Ann, the circumstances have probably been quite hair raising but the end will be wonderful! Wow!! I love your fabric choice and the board and batten will be beautiful. The wood floors will be stunning and I can’t wait to hear how much you love them. They are in my future plans for my first floor. GOD’s plan not our plan. Take good care of yourself during the re-do. Lots of work, but well worth the effort and investment! Hi Nan! I have crown molding everywhere already. I had that installed shortly after we bought the house. Oh Ann, Stunning fabric! I’m so excited for you. Please do keep us updated. I can’t wait for the final reveal. How exciting. I did the same – saved and saved – until we could get new flooring in our entire house. I couldn’t afford hardwood but even the laminate looks so much better than the old carpeting that was in this house when my husband bought it (before we got married 4 years ago). I love the area rug you had in your living room. Hope it wasn’t ruined. I can hardly wait to see the finished results. I love your home and your decorating style. I think it will be beautiful. I love the fabric and the way they coordinate with each other. So pretty and classy! Looking forward to the end results. Renovations are s lot of work but so rewarding. Looking forward to the “after” pictures! I know your excitement – moving and can’t wait to work on a new house! Enjoy the moment! Love the new looks coming. I love board and batten and shiplap too. Just adds so much character. Can’t wait to see the final outcome! So excited for you Ann. Can’t wait to see the finished product. It’s going to be awesome with your eye for beauty and comfort stamped all over it!!! Sounds like a plan. Things rarely go as we think about them. That toilet was your hint to put plan in motion. I love board and batten but I love the wallpaper in the dining room that is on now. Looks like how I picture the dining room. Cheerful and pretty. Very excited for you to be getting what you have waited for. Ann, I am so excited for you. I hope to see your wood floor soon so that I have an idea how it would look in our living and dining rooms. Our floor plan is similar to yours. We just had our rooms upstairs measured for new carpet, but I haven’t made a selection. I selected a PB chandelier for our dining room about six years ago and your new one is very similar. Truly like the pattern samples shown. Looking forward to seeing your rooms completion. Happy spring in Ohio. Heading to Florida in April to join our daughter’s family for spring break. Dear Ann, A new beginning — a fresh start! Good for you! It will be such fun to watch you pull together these rooms! So exciting! How fun to get to do a makeover and all due to making lemonade out of a lemon of water damage! We too had a water flood in the guest room and I got rid of my 13 year old carpet! But replaced it with new carpet as I couldn’t afford wood in there. Can’t wait to see the new look. Are you going to remove the wallpaper yourself? If so, let us know how. I want to remove wallpaper in my entry. 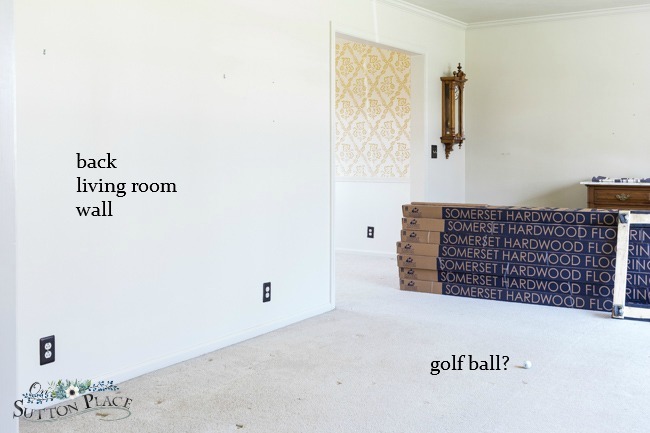 Also, are you going to paint or replace the paper in the dining room?